The Speedway Heavy Duty Trailer Dolly has a super-strong tubular construction. This dolly has a 600 pound tongue capacity with a 1-7/8 ball. It measures, 22Hx28Wx50L. There is 15 inches from the ground to the top of the ball. The tires are 4.10/3.5 - 4 2 ply. The pneumatic tires cushion the load and provide smooth maneuverability for this trailer dolly. This dolly will support 600 pounds for easy maneuverability of utility, boat, cargo, jet-ski and other small trailers. 600 lb. 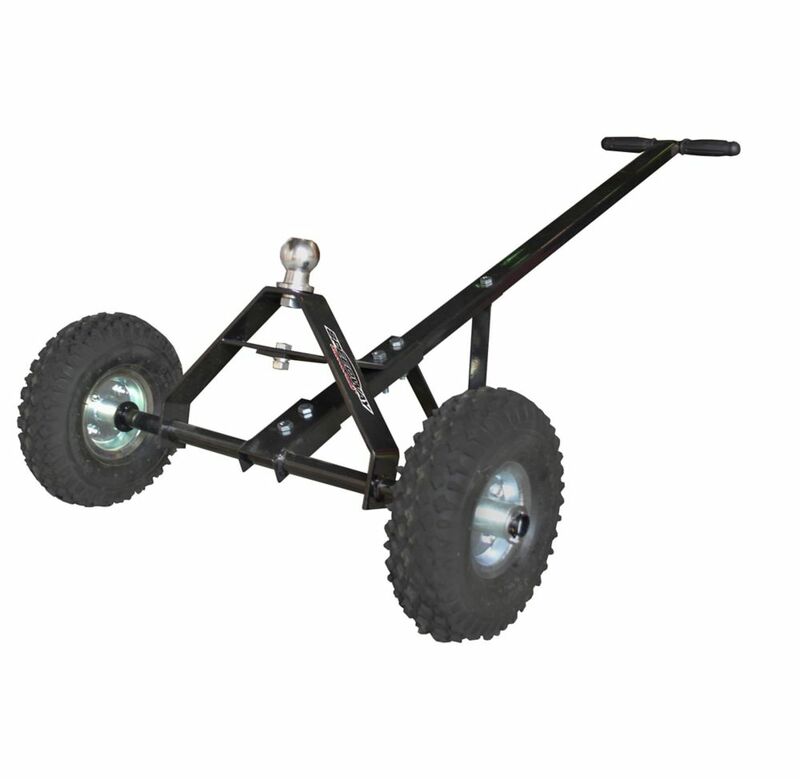 Capacity Heavy-Duty Trailer Dolly The Speedway Heavy Duty Trailer Dolly has a super-strong tubular construction. This dolly has a 600 pound tongue capacity with a 1-7/8 ball. It measures, 22Hx28Wx50L. There is 15 inches from the ground to the top of the ball. The tires are 4.10/3.5 - 4 2 ply. The pneumatic tires cushion the load and provide smooth maneuverability for this trailer dolly. This dolly will support 600 pounds for easy maneuverability of utility, boat, cargo, jet-ski and other small trailers. 600 lb. Capacity Heavy-Duty Trailer Dolly is rated 3.2 out of 5 by 39. Rated 3 out of 5 by Greg from easy to assemble but the wheels hit my trailer jack when trying to turn the trailer. I had to pu... easy to assemble but the wheels hit my trailer jack when trying to turn the trailer. I had to put in a spacer to raise the ball an inch and now it clears. I also added washers to the axle because the wheels were wobbling. Rated 5 out of 5 by DR from Did the trick to move my popup trailer easily. No... Did the trick to move my popup trailer easily. No heavy lifting anymore. Rated 1 out of 5 by Jay from The very first time I used this Trailer Dolly a... The very first time I used this Trailer Dolly a tire blew off one of the rims and caused the wheel axle to bend which causes the wheel to wobble. If it had a solid tire and a 1 piece rim this probably would not be an issue. The rest of it seems to be fairly well made. Retuned it to Home Depot. Will this dolly able to move a 18 ft ski boat. The dolly supports up to 600 lbs on the tongue. The ability to move the trailer is completely dependent on the user and the weight of their trailer. The product overview states that this is rated for a 600# tongue weight. The reviews and q&amp;a indicate that it is rated for 600# trailer weight which is considerably less. Which is correct?? The overview is correct. This unit will support 600 lbs tongue weight.